I started making cards about 6 months ago! I found this site, totally by accident, but LOVE, LOVE, LOVE all the information on this site! THANK YOU CHRISTINA!!!! I found the tutorial for the Trellis Card and following Christina's wonderful directions, I decided to give it a try! I don't have a lot of dies - so I worked with what I had, mainly scissors, paper, markers, and my Cricut! Thanks again Christina, for the great tutorial! Here is my rendition of your card. 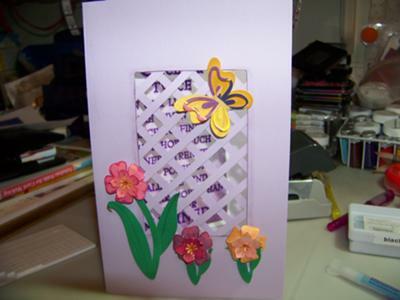 The Trellis card has been a really popular make and there are many submissions featuring this card. Brenda your interpretation is just beautiful and I bet you were pleased with it when you had finished it. I am not surprised that your family commented either. If you would like to make a card as pretty as Brenda then take a look at the step y step instructions in the More Projects in the NavBar to your left. There are lots of ideas and card folds for you to try and all your recipients will be amazed at the cards you produce. Mnay of the written instructions are also in Video Tutorials in case you prefer to see something being done ... I know that is the way for me as I learn more by watching.